Today was our first day in the clinic. 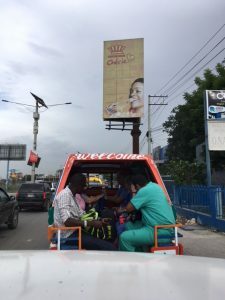 We left the hotel at 7:15am and drove through the crazy Port-au-Prince traffic to Cite Soleil. The team is a combination of people who have been before and people who have not, but it didn’t take long for us all to fall into a good rhythm. We saw about 100 patients – from babies to folks in their 80s – with a wide range of complaints from minor to serious. Malnutrition, air pollution, and a lack of sanitation take a toll on health. Debriefing at the end of the day, we planned for a few changes tomorrow morning. With five doctors, we need more nurses in triage at the beginning of the day and more help in the pharmacy as the day goes on. Our devotion tonight included the passage from 1 Corinthians that we are one body with many parts – and that is what we were.